New Zealand 45 and 4-169 (Dean Brownlie 69*, Brendon McCullum 51, Jacques Kallis 2-19) trail South Africa 8-347 declared (Alviro Petersen 106, AB de Villiers 67, Hashim Amal 66, Chris Martin 3-63) by 133 runs. The South African bowlers struck again by claiming four wickets of New Zealand in their second innings as the hosts are heading towards a remarkable win. The Black Caps were bowled out cheaply for 45 runs in their first innings and scored 169 runs for the loss of four wickets in the second. The Proteas hammered 347 runs with two wickets still in hand when their first innings was declared. 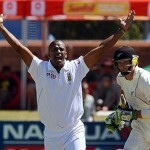 The second day’s play came to an end on Thursday, January 3, 2013, at Newlands, Cape Town. Earlier, the hosts started the day two at 3-252 in 64 overs, Alviro Petersen was at the crease at 103 and AB de Villiers was batting at 19 runs. 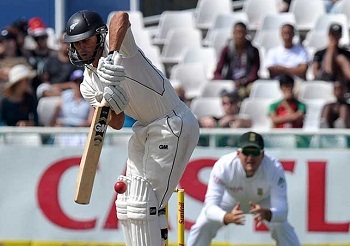 The visitors got an early breakthrough when Petersen was clean bowled by Trent Boult on the first ball of the 66th over for 106 and Faf du Plessis replaced him. The fifth wicket partnership added 26 runs and took the score to 281 when du Plessis was gone for 15. Dean Elgar was the next batsman in as de Villiers kept on cruising from the other end and the third hundred of the innings appeared on board in the 79th over. AB de Villiers dispatched his 30th Test fifty by hitting a couple of fours in the 82nd over. The run rate was controlled by the rival bowlers and the two batsmen gathered 20 runs in the next nine overs. 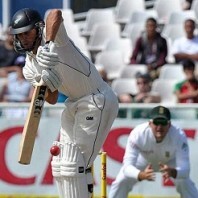 Dean Elgar was caught behind by the wicket keeper BJ Watling off Boult for 21 runs off 52 balls with 2 fours. AB de Villiers was clean bowled by Chris Martin for 67 off 129 balls with 8 fours and Robin Petersen became the eighth victim for five runs. The South African skipper, Graeme Smith, declared the first innings at 347 in 95.2 overs after gaining lead of 302 runs. Trent Boult and Chris Martin were the best performers with the ball and held three wickets each whereas Doug Bracewell and James Franklin shared one wicket each. The Kiwis faced another setback when their prominent opener, Martin Guptill lost his wicket without a run on board. Kane Williamson joined in with Brendon McCullum as they found it hard to post runs on board swiftly and got just six runs in the first six overs. Williamson hit 2 fours in the next couple of overs as McCullum secured his wicket at the other side. The pair crept to 29 in 17.4 overs when Kane Williamson was caught in the second slip by Alviro Petersen off Jacques Kallis for 15. The young Dean Brownlie joined in next with McCullum who scored his first four on the 57th delivery he faced. Brownlie preferred to play his shots by sending the ball out of the fence thrice off Vernon Philander in the 20th over. Brendon McCullum added 2 fours in the 24th over as Brownlie was dropped by Dean Elgar at gully off Dale Steyn at 23 on the fifth ball of the 25th over. The sloppy fielding of the Proteas continued when they dropped both batsmen during the next two overs. Brownlie utilized the chance fully by hitting 3 back to back fours to Morne Morkel in the 29th over. Brendon McCullum attained his 25th Test half century in the next over but was declared leg before wicket off Robin Peterson for 51from 103 balls with 7 fours. Dean Brownlie achieved his fourth Test fifty in the 35th over as Daniel Flynn went back to the dressing room after scoring 14 runs. New Zealand managed 169 runs in 52 overs with six wickets in hand at stumps on the second day. Dean Brownlie was unbeaten at 69 off 89 with 12 fours and BJ Watling secured his end with 10 runs. Jacques Kallis captured two wickets whereas Dale Steyn and Robin Peterson claimed one wicket each. New Zealand still requires another 133 runs to avoid an innings defeat and keeping in view their current batting performance they are in danger of losing the Test against the formidable South Africa.